Leed Rating: EQC4.3 | MRc6 | MRc7 - Carb Phase 2 Compliant & Prop 65 Compliant. The use of a Shop Vac with an exhaust hose out side the room to be installed is best for cleaning. Be sure to keep dust, dirt or foreign particles away from the toungue and groove. The cleaner floor remains remains, the better the install bond between planks. 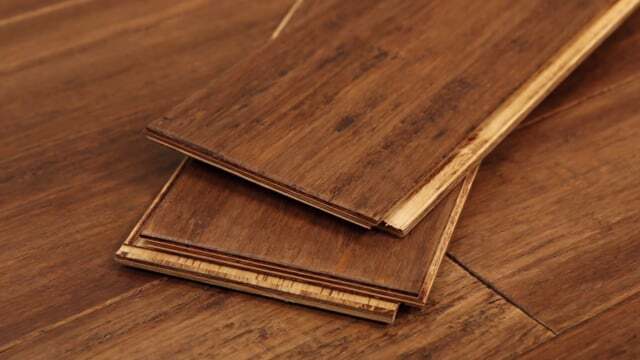 Cali Bamboo Flooring and subfloor room temperature should be between 65° and 85 ° Fahrenheit. Maintain proper temperature for 48 hours before and after installation. The building’s heating and airconditioning system should be turned on at least one week before installation. Cross-stack Fooring on a pallet, mixing boards from each box. Acclimate your Floor as close to the installation area as possible, for at least 5 days in normal living conditions. More time is necessary in extreme climates. As a general rule, the ideal indoor humidity range for hardwood is 40-60% relative humidity. In some climates or households, the average humidity range may be higher or lower. That’s okay! In this case, simply extend the acclimation period, and maintain humidity levels at normal living conditions set during acclimation. 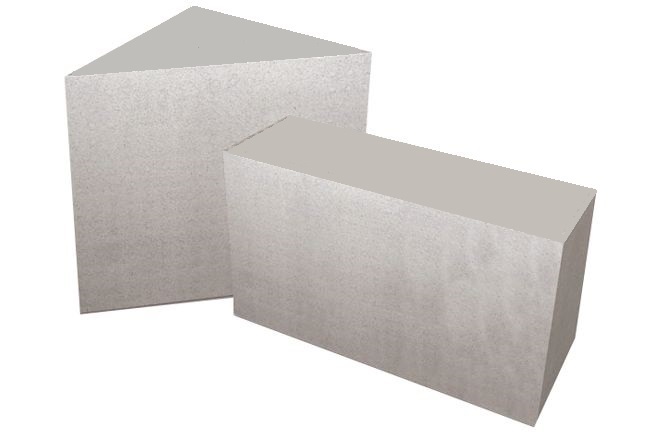 For concrete applications, a moisture barrier/vapor retarder should be chosen based on concrete moisture content. For unlimited moisture protection, use Titebond® 531+ Moisture Control System. Install as recommended by the manufacturer. these guidelines may result in an the Bamboo Failure installation failure (i.e. flooring may expand or contract resulting in gapping). Bamboo is an interior product only, and must be installed in a temperature controlled environment, maintained between 65 and 85 degrees F. Please keep in mind a concrete floor can be up to ten degrees colder than the actual room temperature. Make sure the suboor is at, level, clean and free of debris. New concrete must be cured for at least 60 days. Test the suboor moisture prior to installation and apply an appropriate moisture barrier such as Titebond® 531+ on concrete suboors. Leave at least 1/2” expansion spaces between ooring and ALL vertical objects (walls, cabinets, pipes, etc.) 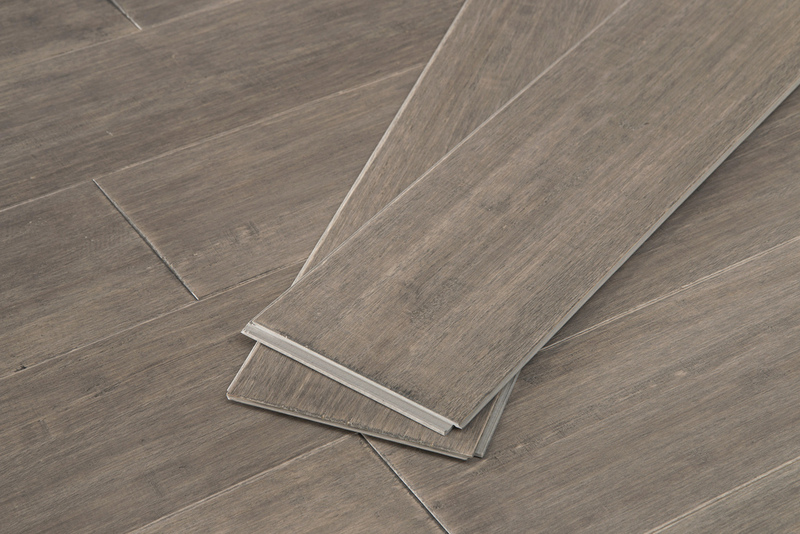 Large flooring runs may require additional expansion space. For Floating floors, use transition moldings between rooms and in doorways. Undercut door jambs and casings to provide adequate expansion space. Do not screw or nail cabinetry or other permanent fixtures to a floating floor. 4. It is recommended to install the planks parallel to the longest wall. 5.Click a few rows together before full installation to confirm your layout plan. 6.Begin by laying the first plank in a corner with the long grooved side toward the long wall. 7. Connect short side of second plank together with mating side of the first plank. 8.Cut the last plank and complete the row. Use the remaining plank to start the second row. 9. Make sure to offset the end joints of consecutive rows by a minimum of 6 inches for best appearance. 10.Begin the second row by clicking the long edge of the planks together. 11. Begin at an angle and press the plank downward to fully engage the click lock system. 12.Repeat this process for the second plank with the short end of the plank covering the mating end of the previous plank. Use a hammer and tapping block to ensure proper engagement. 13.Repeat this process for remaining rows keeping 6 inches between joints and maintaining a 1/2” expansion gap around fixed objects. 14.The last row may require rip cutting the planks to size, be sure to cut enough to maintain proper expansion gap. 15.As with the other rows, complete the last row by connecting the long edges. After Installation The newly installed floor is complete and can be walked on immediately. 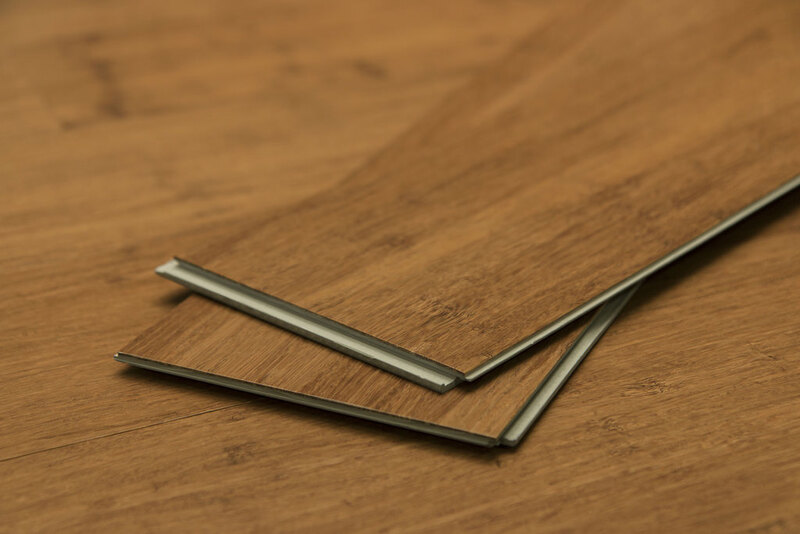 Cali Bamboo® flooring is treated with an industry-leading scratch resistant coating, and its density and strength surpasses almost any other flooring in the world. Bamboo flooring is tough, but all hardwood flooring is pervious to dents, scratches, discoloration or other natural or man-made damage. Prevention is a big part of the care for bamboo floors. • Cali Bamboo recommends you vacuum or sweep the floor on a regular basis or as needed to remove dirt, sand or grit. • Soak up spills immediately using a dry towel or dry mop. • For general cleaning, use Bona Pro Hardwood Floor Cleaner & Bona Pro Hardwood Floor Mop. • Fit furniture legs with felt tips or protective caps. Fix rolling furniture with soft rubber casters. Pick up heavy furniture or appliances; do not slide. • Keep pets nails trimmed to avoid excess scratching. • Limit direct sunlight on floor by using curtains and blinds in areas that are exposed to high UV rays. • Maintain relative humidity between 40%-60%. • Never wet-mop a hardwood floor. Standing water may cause permanent damage. • Never use any of the following products on your floor: ammonia-based cleaners, acrylic finishes, wax-based products, detergents, bleach, polishes, oil soap, abrasive cleaning soaps, or acidic materials such as vinegar. Never apply wax treatments to your floor. • Use interior and exterior doormats at entrances to prevent dirt and moisture from being tracked onto the floor. Area rugs are also recommended in front of kitchen sinks and in high traffic areas. Do not use rugs with solid rubber or vinyl backings. Rugs must be made of a breathable material to prevent moisture entrapment. We recommend using a breathable rug underlay. Mesh or grid patterns are best. Never wet (or damp) mop your floor. Standing water can damage the floor.... You may periodically use a very slightly dampened (near dry) mop to spot-clean; however excessive moisture will dull the finish. 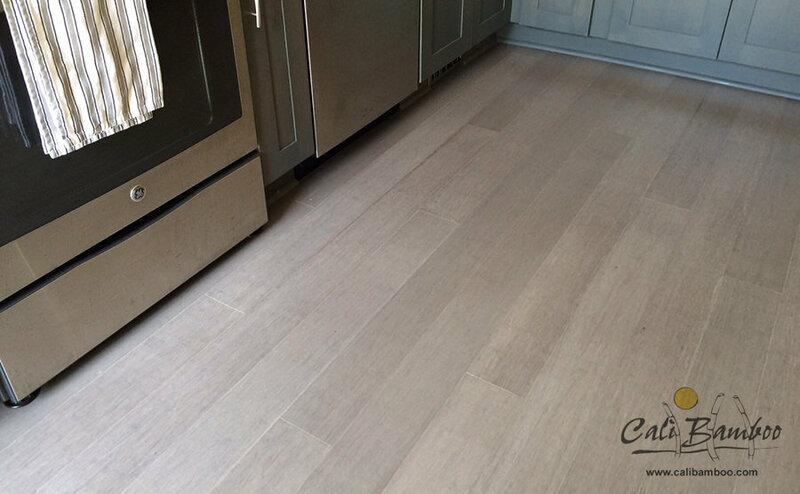 For wood flooring in the kitchen, place an area rug in front of the kitchen sink. We recommend using Bona Pro Hardwood Floor Cleaner & Bona Pro Hardwood Floor Mop to clean your floor. 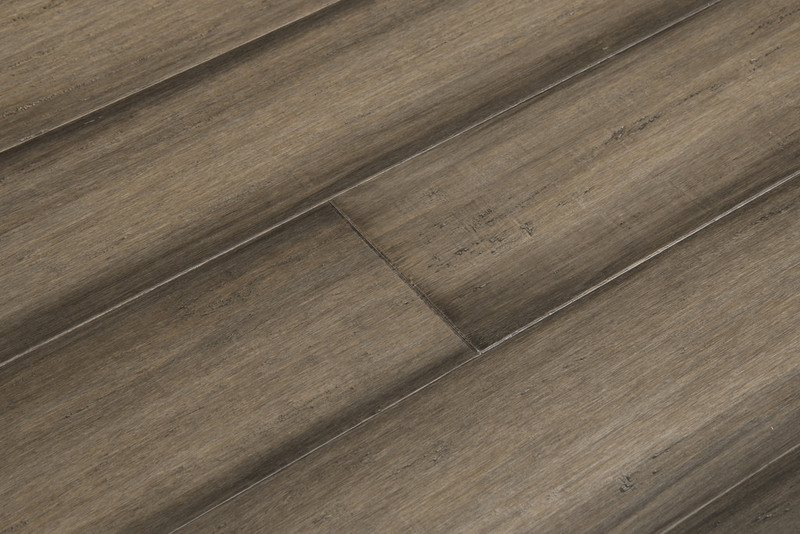 Floor noise is normal and will vary from one installation type to the next. Occasional noise is due to structural movement and may relate to sub-floor type, flatness, deflection, and/or related to the fasteners, changes in environmental conditions, relative humidity and the amount of topside pressure applied to the flooring. For these reasons floor noise is not considered a product or manufacturer defect. When installing Cali Bamboo® glue down of floating you should work out of a minimum of 3 boxes and mix planks or tiles when installing. Subfloor must meet all above requirements. Concrete must be fully cured and at least 60 days old. Concrete must be free of dirt, oil, paint, old adhesive, wax, sealers and curing agents. Concrete that is not properly leveled can cause improper adhesive transfer, hollow spots, and squeaks. Sand or grind down high spots. Level low spots with appropriate leveling material; allow extra drying time for the leveling compounds. Test subfloor moisture content. To minimize moisture transfer from the slab, apply: Titebond 531+ Moisture Control System. 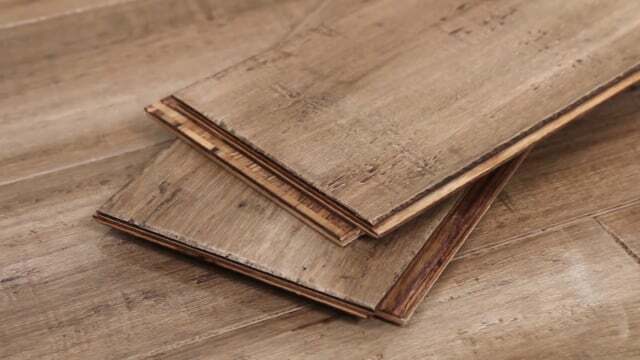 Cali Bamboo® flooring is only recommended for use over radiant heat systems if the special requirements specified by the National Wood Flooring Association are met (please refer to the NWFA’s Radiant Heat Guidelines). Ensuring stable job site conditions, subfloor suitability and proper acclimation are especially important when installing over a radiant heat system. It is the responsibility of the installer to ensure that the recommended environmental conditions are met for installation. 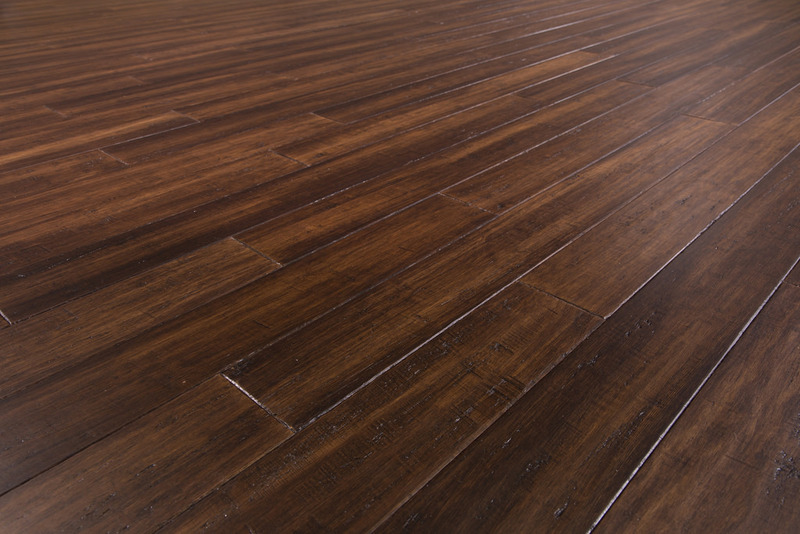 Refer to your radiant heat system manufacturer to determine its compatibility with bamboo flooring, and to learn the specific requirements for installation. • Because of the wide variety of systems on the market (Hydronic, embedded in concrete, electrical wire/coil, heating film/mat) each with its own features and applications it is recommended that the user consult with the radiant heating provider for best practices, installation methods and proper subfloors. • Typically the floating installation method is the most suitable for use with radiant heat systems. • Radiant heat system must be turned on and in operation for at least 6 days before installation. 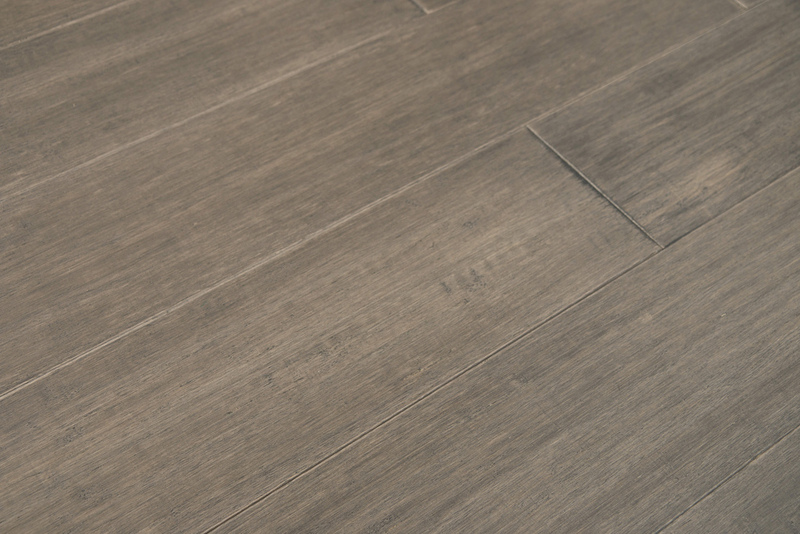 • The flooring must be acclimated per Cali Bamboo’s Fossilized acclimation instruction over the radiant heat with the system turned on throughout the acclimation timeframe. • The system must be turned down to 65°F and maintained 24 hours prior to installation. • Once install is complete, turn system back on and slowly bring back up to normal operating temperature over a period 4-5 days. • Floor should never be heated over 80°F. Consult with your radiant heating system manufacturer to successfully limit the maximum temperature. • Always remember that rugs placed over radiant heated flooring can increase the surface temperature in that area by 3°- 5°F degrees. • Relative Humidity must be maintained between 40-60%. The use of a humidifier may be necessary to achieve this. • When turning off the radiant heat system it must be turned down slowly at a rate of 1.5° degrees per day. You should never just turn the system off. • For additional information on radiant heating systems please refer to http://www.radiantpanelassociation.org or the NWFA’s Radiant Heat Guidelines. 1. Use Titebond® Tongue & Groove Flooring Glue for floating applications. 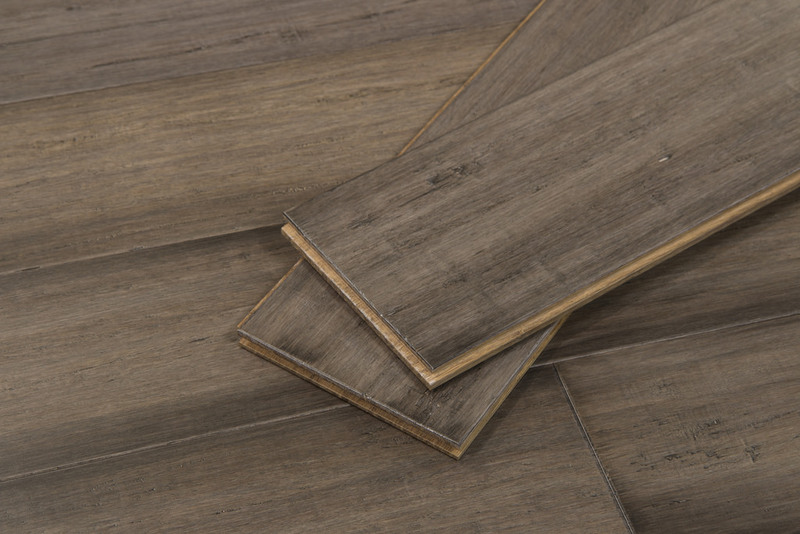 2.Before you start, ensure that the job site, subfloor and environmental conditions are acceptable for installation of Cali Bamboo® flooring. All requirements specified in Cali Bamboo’s Installation Guidelines must be met. 3.Seal concrete subfloor with Titebond® 531+ Moisture Control System prior to installation. 4.Allow at least a 1/2” space for expansion around the perimeter of the room and all vertical objects using spacers. Also see section: “Expansion Space is Required”. 5. It is recommended to install the planks parallel to the longest wall. 6.Dry lay (do not glue) a few rows before installation to confirm your layout plan. 7. Begin by laying the first plank in a corner with the long grooved side toward the long wall. 8.Apply a small continuous consistent bead of Titebond™ T&G flooring glue along the bottom side of the flooring groove. 9.Connect short side of second plank together with mating side of the first plank. 10.Cut the last plank and complete the row. Use the remaining plank to start the second row. 11. Make sure to offset the end joints of consecutive rows by a minimum of 6 inches for best appearance. 12.Continue second row by connecting short edges of planks first with long edges. 13.The last row may require rip cutting the planks to size, be sure to cut enough to maintain proper expansion space. 14.As with the other rows, complete the last row by connecting the short edges first and using a pull bar to tap the long edges together. • Always remove any adhesive from the surface of the flooring (smudges, fingerprints, etc.) before it dries. Use Bostik’s™ Ultimate Adhesive Remover Towels to immediately remove any adhesive on flooring surface as you go. • Allow the newly installed floor to fully cure based on adhesive recommendations before walking or moving furniture onto the floor. 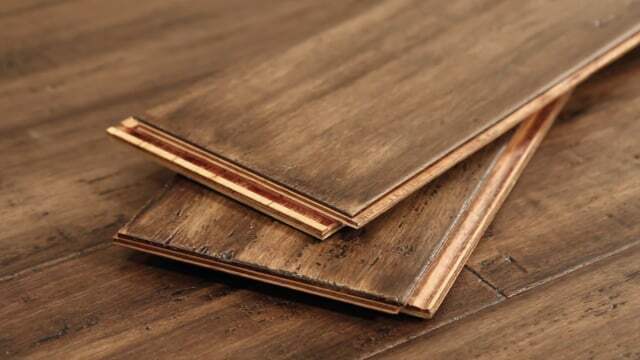 The nail-down method is suitable for wood subfloors. Before you start, ensure that the job site, subfloor and environmental conditions are acceptable for installation of Cali Bamboo® flooring. All requirements specified in Cali Bamboo’s Installation Guidelines must be met. The selection and use of any nailer is at the discretion and responsibility of the installer/ homeowner. Choose a nailer model that is specifically designed for tongue and groove applications. We recommend a Pneumatic 18 Gauge Flooring Nailer (such as Powernail 50p Flex or similar). It is the installer’s responsibility to determine the correct pressure for their nailer, and to ensure that the fastener is properly seated. 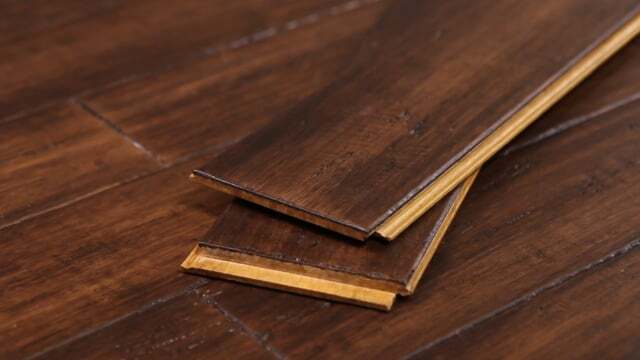 Dimpling of the flooring face or edge is not a manufacturing defect. 1. 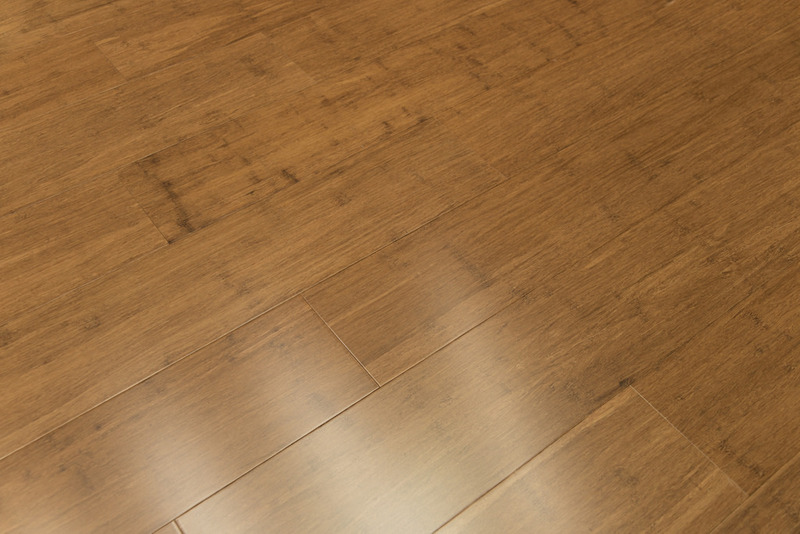 Use a moisture barrier designed for wood subfloors (see “Moisture Barrier Requirements”). 2. When nailing, the flooring should be always laid perpendicular to the floor joist. 3. Allow at least a 1/2” space for expansion around the perimeter of the room and all vertical objects using spacers. Also see section: “Expansion Space is Required”. 4. Dry lay (do not nail) a few rows before installation to confirm your layout plan. 5. Test the air pressure and angle of your pneumatic nailer with a sample plank to check for correct air pressure before installation. If you note any surface damage (face dimpling), tongue damage (splitting), etc., adjust the air pressure/angle accordingly. Test until dimpling no longer occurs. 6. Begin installation next to an outside wall. This is the best reference for establishing a straight working line. 7. Hold starter row in place by blind nailing or gluing to avoid unsightly nail marks. 8. Connect short side of second plank together with the mating side of the first plank. 9. Cut last plank and complete row. Use the remaining plank to start the second row. 10. Be sure to offset the end joints of consecutive rows by a minimum of six (6) inches for best appearance. 11. Continue second row by connecting short plank edges first with the long edges. 12. After the first two rows are secured, start the next row by nailing directly above the tongue at a 45 degree angle. 13. Carefully monitor nailer pressure to ensure that the nail head enters the tongue only as deeply as required to allow the adjacent plank to fit properly. Ensure that the nail head rests cleanly in the “nail pocket”. 14. Recommended nail spacing is 8 to 10 inches along the length of each board. 15. Avoid nailing closer than 4 inches from the end of the plank. 16. As with the other rows, connect the short edges first and use a pull bar to tap the long edges together. 17. Always check your working lines to be sure the floor is still aligned. 18. The last row may require rip cutting the planks to size. 19. The last two rows will need to be secured in the same manner as the first two. • The newly installed floor is complete and can be walked on immediately. 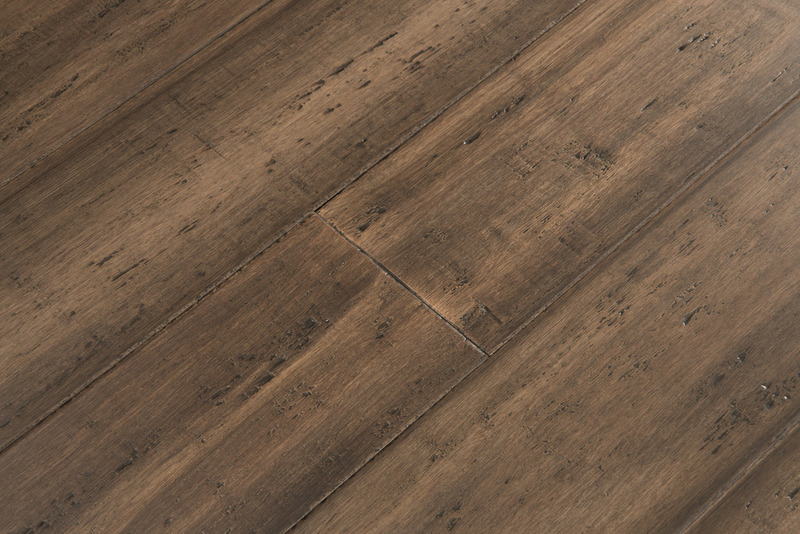 • Use wood filler or putty to correct minor flooring damage that occurs during installation. 1. 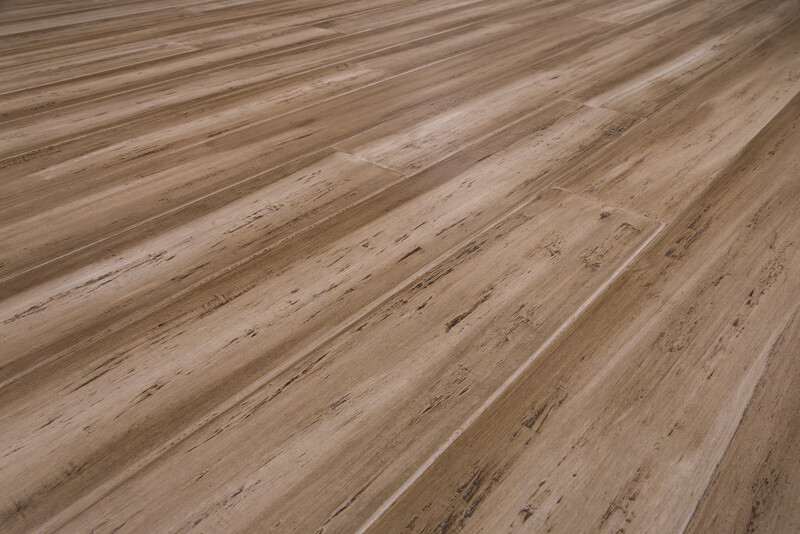 Before you start, ensure that the job site, subfloor and environmental conditions are acceptable for installation of Cali Bamboo® flooring. All requirements specified in Cali Bamboo’s Installation Guidelines must be met. 2. Seal concrete subfloor with Titebond® 531+ Moisture Control System prior to installation. 4. Dry-lay a couple rows before starting installation to confirm your layout plan. 5. Begin installation next to an outside wall. This is the best reference for establishing a straight working line. 6. Lay the first row of flooring with groove facing the wall. Starter rows should be secured by blind nailing and gluing. 8. Cut last plank and complete row. Use the remaining plank to start second row. 9. Offset end joints of consecutive rows by a minimum of 6” for best appearance. 10.With the first row in place, trowel out some adhesive and lay second row by connecting short edges of planks first. Use a pull bar to tap long edges together. 11. Always check your working lines to be sure the floor is still aligned. 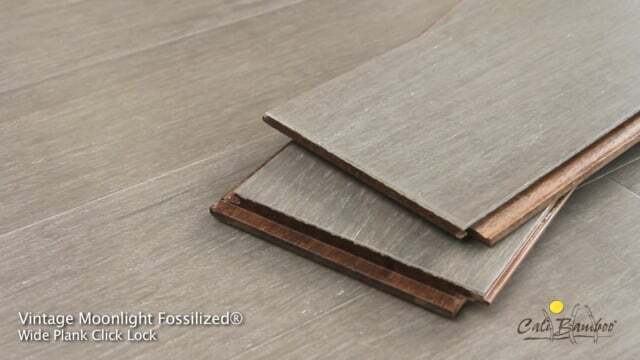 12.Use tapping block to fit planks together, but be careful not to let installed floor move on the wet adhesive while you are working. 13.The last row may require rip cutting the planks to size. 14.Flooring planks on perimeter of room may require weight on them until adhesive cures enough to hold them down.